For my Wordless Wednesday entry, kindly scroll down or click HERE. I am also thankful and blessed to have a family who taught me the value of generosity...truly, it begins at home. I am also thankful for God's mercy in giving me IT Guy who has been so supportive and understanding with all my "charitable" works. IT Guy and I (together with some Christian volunteers) will start with our first feeding program for less-privileged children. Well, this is usual for me...but to commit to it as an ongoing project...with IT Guy...is something so so delightful! And since we all know it is always better to teach a person to fish that to give him a fish, I will also be doing a skill inventory in that community and see if I can bring some livelihood projects for them. All these things are never easy...but He is helping us do all these things. So this week, I share the following verse as IT Guy and I made it our commitment to server the LORD. And we shall teach/ pass this on to our children, and our children's children. "...as for me and my household, we will serve the LORD." To know more about this wonderful WFW Community please click the WFW logo above. I invite you all to join with us in celebrating His words at WFW. I LOVE this verse! It's on several wall hangings, plaques, needlepoints, etc... all over our home! It is SO important in today's world. May your house increase and your ministry be blessed! Happy WFW! Awesome verse and photo. Steve and I have this in our home in at least three places that I can think of right off hand, maybe more. I love the gazebo in the photo. We used to have one very similar to it before we moved (over 15 years ago!) and I miss it very much. I'm so glad you're touching the lives of so many - you truly have a servant's heart. Happy WFW to you! Living accoring to this verse is just the least way I could give back all the blessings I received from Him. Thanks for the kind thoughts! Yes it is! And living through it is even greater! May we all serve Him as He has served the world. 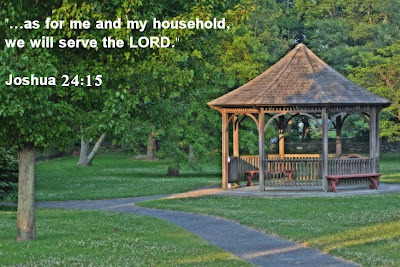 As for me and my house we will serve THE LORD! Beautiful and POWERFUL scripture. One of my very favorites. Mar, what a great commitment. Praying that God will bless you immensely as you stay under his safety net! That is a great thing that you and IT guy are doing for the children. God bless. Such a wonderful verse and so wonderful you have someone who is committed to walk that faith with you and to raise your children in that faith, too. May God bless you and your family as you serve Him together. Thanks for all your prayers and encouragements. You are in my thoughts and prayers. Take care and have a very blessed Lord's day! Just wanted to say hello. I'm back from vacation and had a great time! that was lovely. good for you for doing all that wonderful work. it feels so good to help other people...especially children.